Reported political participation rates in the three African countries surveyed are highest for traditional forms of participation (having voted in an election, attended a campaign event or speech and participated in a volunteer organization). And voting is, by far, the most common form of political participation tested, with roughly three-quarters or more saying they have voted in an election at some point in their lives. Younger adults – ages 18 to 34 – are less likely than those 50 and older to have voted in the past. The largest age differences are in Kenya and South Africa, where more than nine-in-ten older adults have voted in the past (95% and 94%, respectively), compared with roughly six-in-ten younger adults (59% and 62%, respectively). In Nigeria, the country that held its general election most recently, a much larger percentage of younger adults report having voted (80%), but they still trail their older counterparts by 10 percentage points. Roughly half of Kenyans have attended a political campaign event or speech. In South Africa, where the African National Congress has been in power for over two decades, only 37% say they have attended a campaign event. And in all three African countries surveyed, about four-in-ten have participated in a political, charitable or religious-based volunteer organization. Gender plays a significant role in political participation in Nigeria. Women in Nigeria are less likely than men to have attended a campaign event or speech (28% of women vs. 59% of men), participated in a volunteer organization (30% vs. 52%) or voted in an election (80% vs. 89%). Taking part in organized protests is less common than more traditional forms of participation, such as voting, attending a campaign event, or participating in a volunteer organization. And in South Africa, men (33%) say they are more likely than women (22%) to have taken part in a protest. Overall, online political participation is relatively low – roughly one-in-five or fewer report having engaged in any form of online participation. In Kenya, the rate is roughly one-in-eight or fewer. In South Africa, men, young people and those with a secondary education or more are more likely to say they have posted their thoughts on political or social issues online. Majorities across Kenya, Nigeria and South Africa say they are likely to take political action, such as contacting an elected official or participating in a demonstration, on the full range of issues tested. Roughly seven-in-ten or more say they are likely to take political action over poor health care. Similar shares across these three countries say they would take action on poor-quality schools and poverty. Smaller shares say they are likely to act on the issues of government corruption, police misconduct or discrimination against ethnic groups. The likelihood that people will take action over a range of issues varies by educational background. In South Africa, those with a secondary education or more are more likely than those with less to say they would take action on all but one of the issues tested – police misconduct. For example, almost three-quarters of those with a secondary education or more (74%) are likely to take action on poverty, while 62% of those with less than a secondary education are similarly inclined. 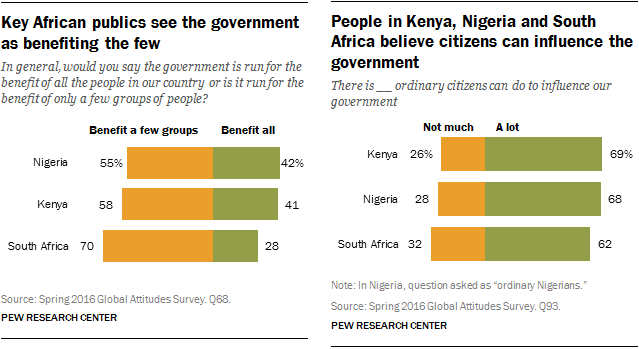 Majorities in all three African countries surveyed believe that the government is run for the benefit of only a few groups of people. Yet, roughly six-in-ten or more think that ordinary citizens can do a lot to influence the government if they are willing to make the effort. South Africans are especially likely to believe government is run for the benefit of the few. Those in South Africa with a secondary education or more are more likely to think government is run for the benefit of a few groups (81% vs. 63% for those with less than a secondary education), but also more likely to believe that ordinary citizens can influence the government (68% vs. 58%).